Ingredients: Beef, whole grain corn, barley, chicken by-product meal, corn gluten meal, whole grain wheat, rice, beef fat (preserved with mixed tocopherols), soybean meal, poultry by-product meal, glycerin, egg flavor, natural chicken flavor, oatmeal, poultry digest, pork digest, calcium carbonate, salt, monocalcium phosphate, dicalcium phosphate, potassium chloride, dried carrot, dried pea, iron oxide, vitamin E supplement, niacin, vitamin A supplement, calcium pantothenate, pyridoxine hydrochloride, vitamin B12 supplement, thiamine mononitrate, vitamin D3 supplement, riboflavin supplement, menadione sodium bisulfite, folic acid, biotin, zinc sulfate, ferrous sulfate, manganese sulfate, copper sulfate, calcium iodate, sodium selenite, choline chloride, l-lysine monohydrochloride. 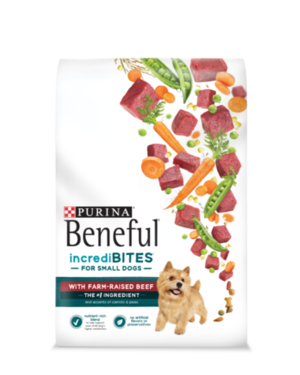 Beneful IncrediBites With Real Beef is formulated to meet the nutritional levels established by the AAFCO Dog Food Nutrient Profiles for the maintenance of adult dogs. We'll begin this review of Beneful IncrediBites With Real Beef with a detailed discussion of the ingredients. The first ingredient is beef. Although beef is an excellent protein source, raw beef contains more than 60% moisture. After cooking, the relative meat contribution of beef is dramatically reduced. Therefore, it's important to ensure that other meat sources are included within the first few ingredients to ensure the product derives most of its protein from meat. The second ingredient is whole grain corn. Whole grain corn is the entire corn kernel (the germ, bran, and endosperm). Corn is a cereal grain which provides a modest amount of vitamins, minerals, and plant based protein. It also happens to be one of the most controversial ingredients in dog food. 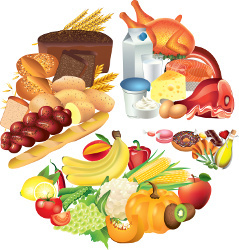 In regards to digestibility, the claims of "highly digestible" are only true if corn is processed into a meal or flour and subsequently cooked. In regards to the protein contribution, we must note that corn is a plant based protein which does not contain all of the necessary amino acids required by dogs to sustain life. Therefore substituting corn for meat is an unsuitable substitution and actually degrades the overall protein quality of the product. Finally, we'll discuss the claims about vitamins and minerals in corn. Although corn does provide many vitamins and minerals, it not necessarily an exceptional ingredient in this regards. There are many other ingredients which are more complete and biologically appropriate. Therefore the usage of corn as the primary ingredient in dog food should certainly warrant further questioning. The third ingredient is barley. Barley is a nutritious carbohydrate source, naturally rich in dietary fiber and various minerals. Unlike pearled barley, regular barley contains the entire grain. The fourth ingredient is chicken by-product meal. Chicken by-product meal is produced by cooking chicken by-products using a process called rendering. By-products are defined by AAFCO as the "non-rendered, clean parts, other than meat, derived from slaughtered mammals." Thus, chicken by-products contain nearly all parts of chickens which are typically not consumed by humans. These parts include the liver, lung, spleen, kidney, stomach, blood, intestine, bone, etc. Like other meat by-products, chicken by-products are considered controversial, mainly because they are inexpensive ingredients which consumers have equated with slaughterhouse waste. However, manufactures and many experts claim that animal by-products are unjustly criticized. Proponents state that "named" by-products, such as chicken by-products, supply many important nutrients required by dogs. The fifth ingredient is corn gluten meal. Corn gluten meal is a by-product from the production of various corn products (corn starch, corn syrup, etc). It's very high in protein (nearly 60% protein) and therefore can significant boost the protein content of the product. Because plant based proteins such as corn gluten meal are inferior to meat based proteins (lack many essential amino acids), they are not suitable substitutes. Because ingredients are listed in order of pre-cooked weight, the remaining ingredients in Beneful IncrediBites With Real Beef are not as important as the first five ingredients. Next we have whole grain wheat. Whole grain wheat contains the entire grain of wheat (the germ, bran, and endosperm). Wheat is the second most-produced cereal grain in the world (corn is the first). Although wheat is a controversial ingredient, it is not necessarily undesirable because it provides dietary fiber and many other nutrients. However, wheat contains a notable amount of plant based protein, which is inferior to meat based protein and therefore an undesirable substitution. The next ingredient is rice. Rice is a gluten-free carbohydrate source. As long as the bran and germ of the grain are intact, rice can provide a notable amount of fiber and nutrition. However, because the type of rice ("brown" or "white") is not specified, we cannot make this determination. Then we have beef fat (preserved with mixed tocopherols). Fat is an important part of your dogs diet, beef fat in particular is a good source of essential fatty acids. Moving on, we have soybean meal. Soybean meal contains more than 50% protein. Therefore, soybean can significantly boost the protein content of the product. The inclusion of non-meat protein typically degrades the overall quality of protein in the recipe. This degradation is due to the inferior amino acid profile of plant based proteins. Moving on with this review, we have poultry by-product meal. Poultry by-product meal is a controversial ingredient because the source animal is not specified. Anonymous ingredients such as poultry by-product meal are typically low-quality ingredients in comparison to named protein by-product meals (e.g. chicken by-product meal, turkey by-product meal, duck by-product meal). The official PawDiet rating for Beneful IncrediBites With Real Beef is 1.5 out of 5.